There is so much variety in this post! I loved seeing the different styles of so many tunics and now I want to add several more to my wardrobe. 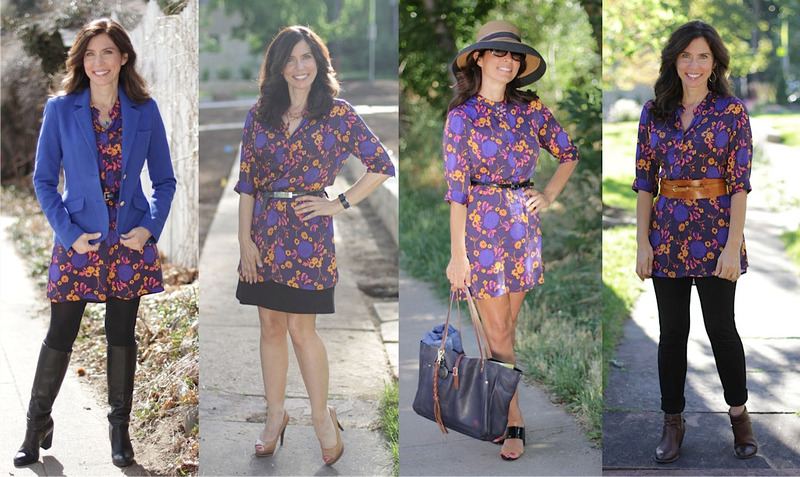 You might want to as well after seeing all these lovely ladies wearing their favorites. Enjoy! What a touching memory about a very special piece of clothing! It has been 10 years this month since Shelbee’s mother passed away, so it is amazing to see that the tunic they created together looks brand new. Thank you to Shelbee for sharing this story with us. A great detailed shot of Claudia’s tunic. 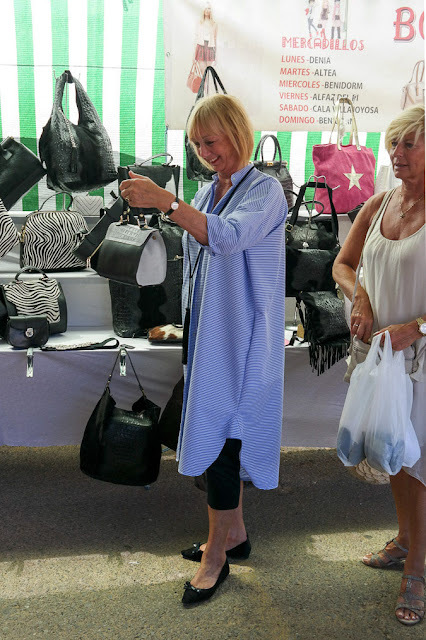 Greetje of No Fear of Fashion wears a blue and white striped tunic dress with black leggings and black flats while shopping with friends in Spain. I like this color on her! Becky of Pink Cheetah Vintage is wearing a long vintage tunic, one vintage cuff and one cuff by Free People. Wide legged trousers and platform sandals by Matiko Lyon lend a cool vibe to this late-60s inspired outfit that reminds me so much of Talitha Getty. See how Alice styled this very same tunic another way by going over to Adrienne’s post! 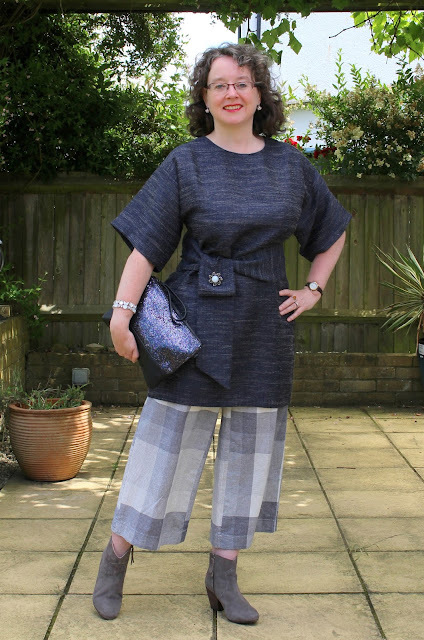 Tunics can be a tricky article of clothing for me since plenty of them hit me in the wrong area and are not flattering. 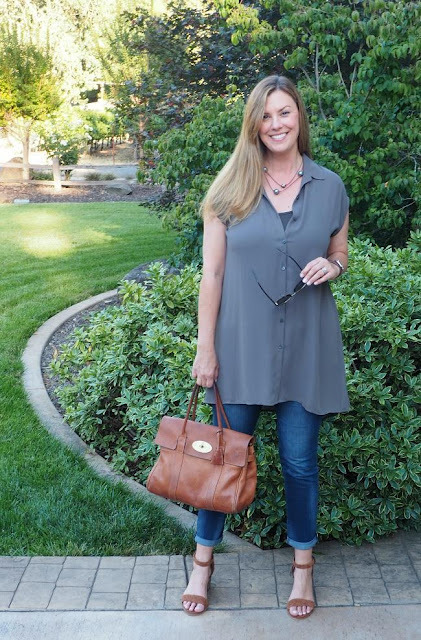 I wasn’t holding my breath that this blue tunic from Old Navy would work but I was pleasantly surprised by the fabric, fit, details and price! 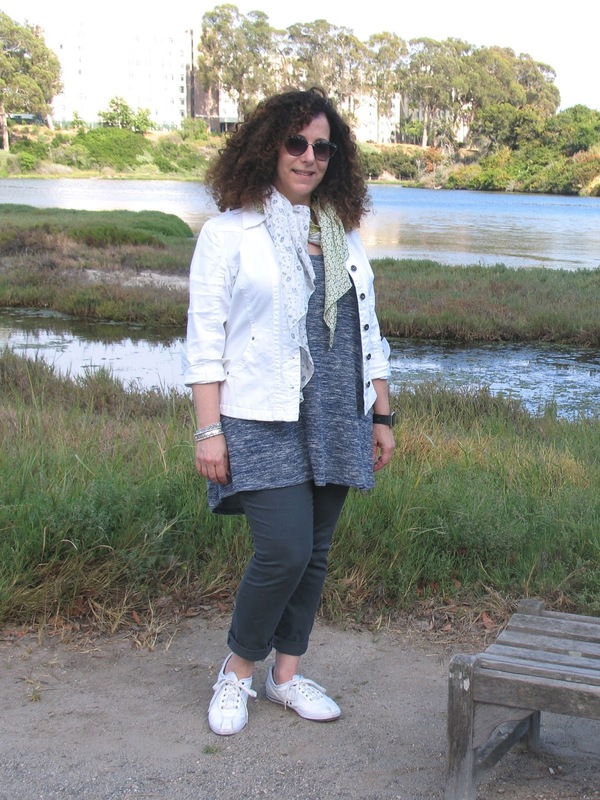 I am wearing it here with white capris and metallic flats. 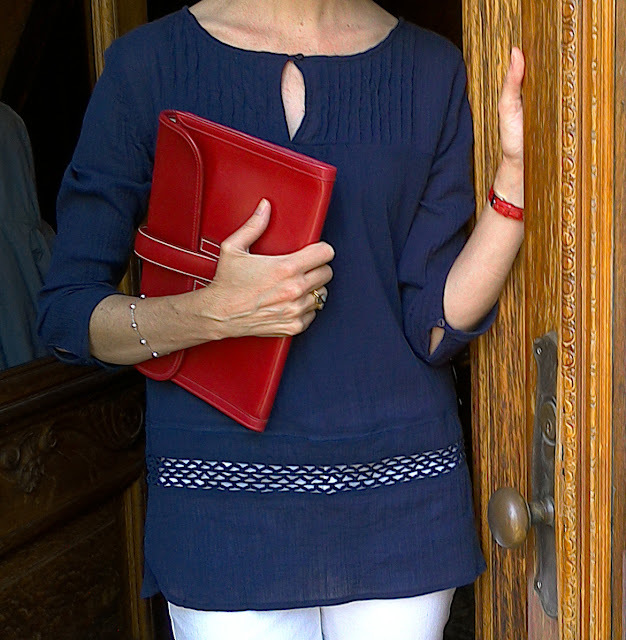 The clutch is my beloved vintage Hermès Jigé in Rouge Vif box calf, which just got treated to a home spa to retain its glow! Details of the tunic and clutch! 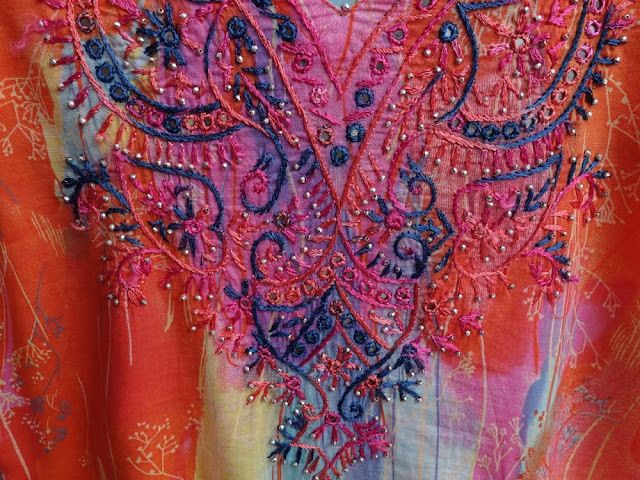 An even more detailed shot of the tunic and the earrings. I normally never wear dangling earrings—they don’t look good with my bob, for one, and I also find them uncomfortable. After years of heavy earrings in the 80s I can only wear studs these days! I decided to give these particular earrings a try since my hair has grown out a bit and the earrings were included with my purchase last spring of a Kentucky Derby fascinator (what a nice gesture by the eBay seller). I like the glamour these earrings lend to the tunic! I realize they are hard to see so I wanted to include a closer shot. I think Liz would approve, don’t you? She wrote in her book that she loved long, drippy earrings! 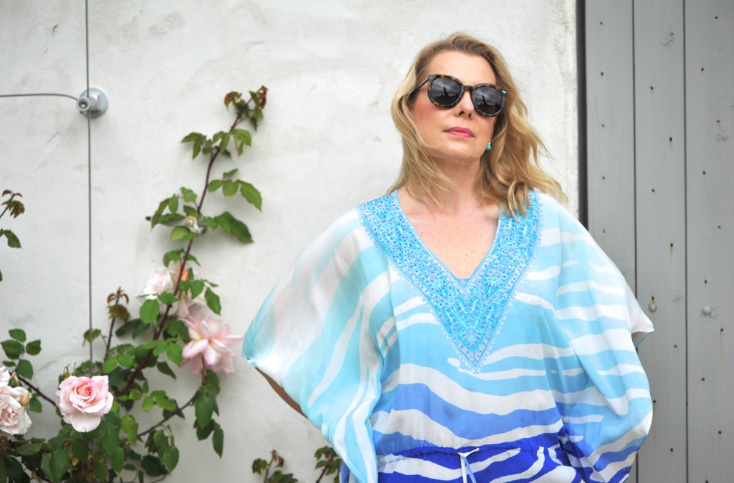 I hope you are wearing your tunic to some exciting locations this summer! 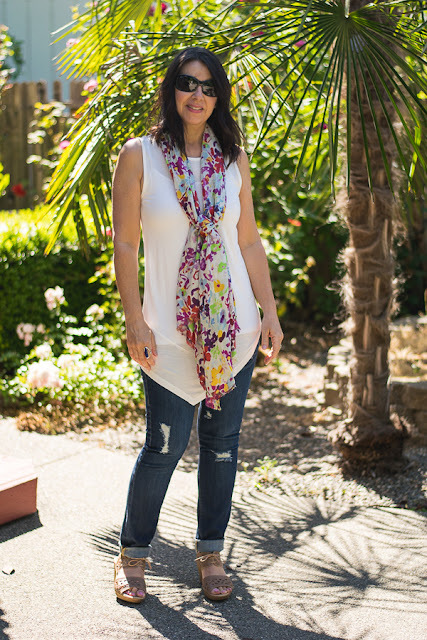 Do swing by Adrienne’s to see even more great looks featuring tunics. 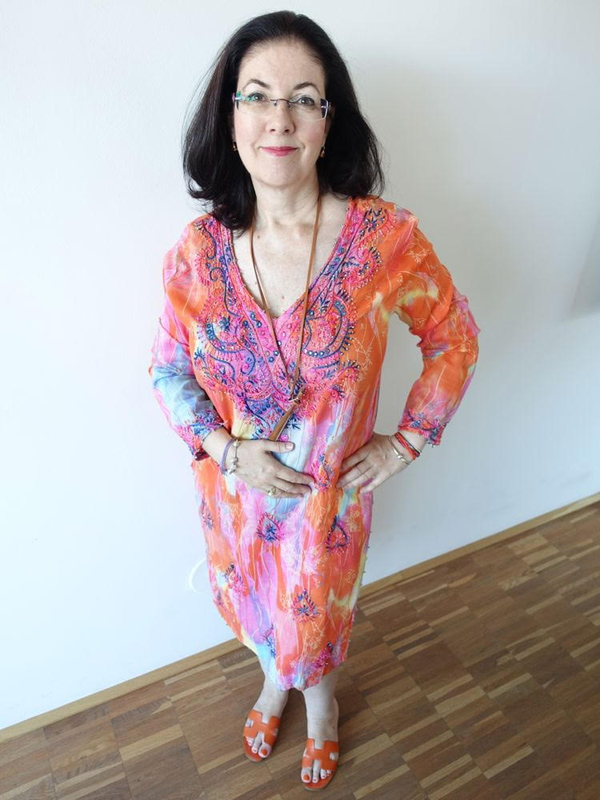 I see now that a tunic can be interpreted as a different article of clothing for so many people. I was impressed with all the different versions and styling. Very nice outfit Jill. 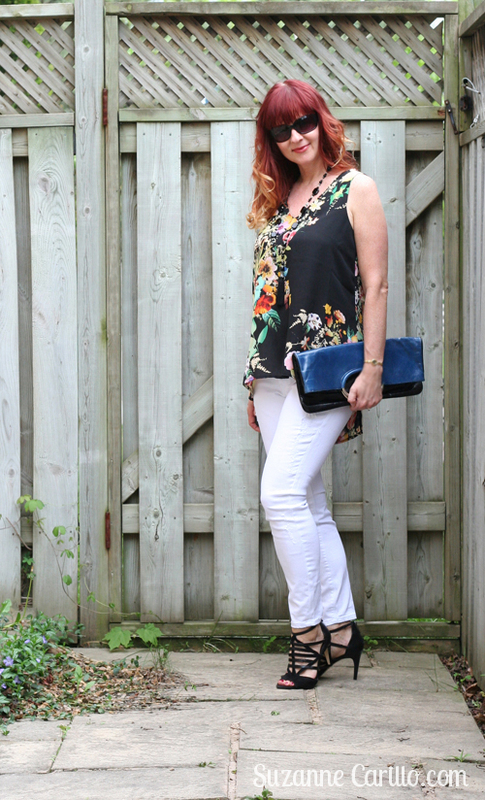 I very seldom see capris work this well and the earrings are a hit too. 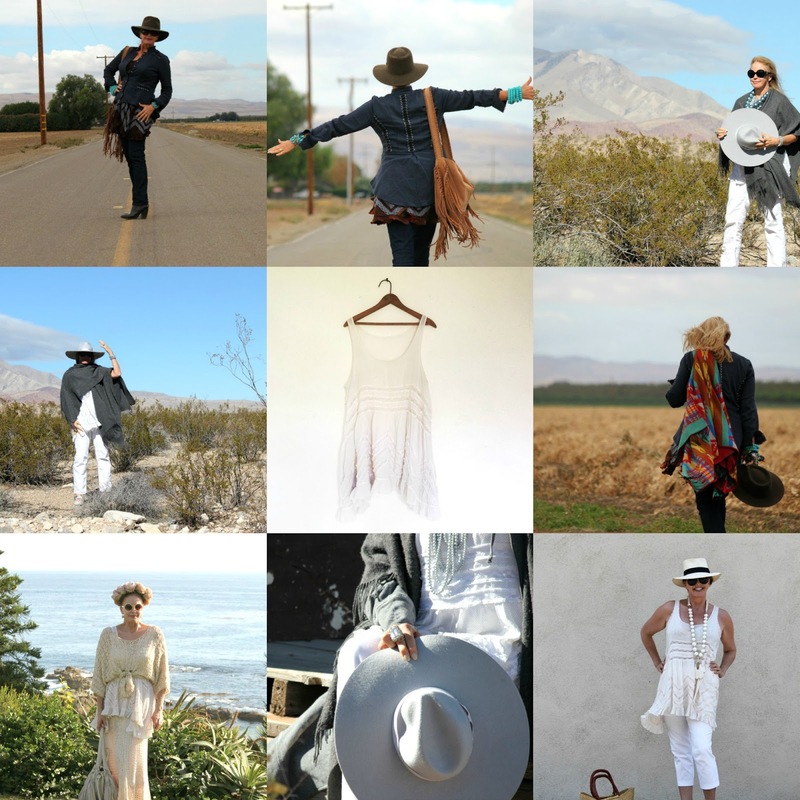 Jill thank you so much for featuring my all white outfit! I too found it really interesting how a tunic was interpreted, it's obviously such a versatile piece. 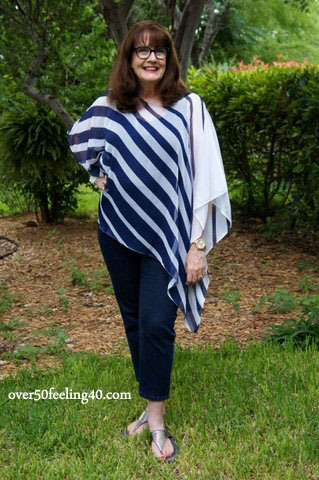 Your navy top is uber chic, it looks so fabulous with white Capris! 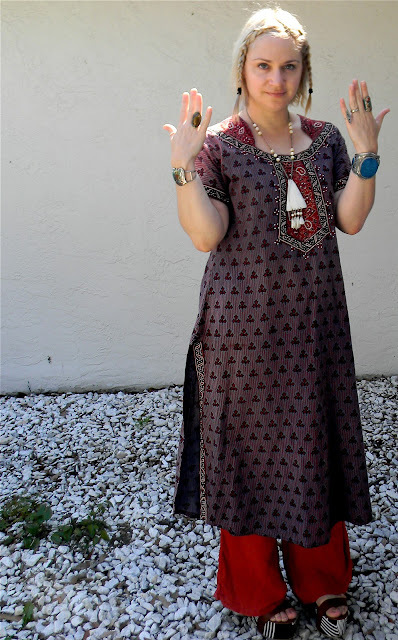 So many beautiful tunics, such great examples. I hesitate to single out one, but I cannot start cheering about 5 which I would like to own, now can I? Therefore, not that I don't like the others, I like to say that I really love Jacqueline's tunic. Such an unusual piece which suits her so well. Too bad you packed those gorgeous earrings away Jill. But I understand. The hair matters. Lovely to see the diversity of tunics. I like Jacqueline s best! But all these women look great! 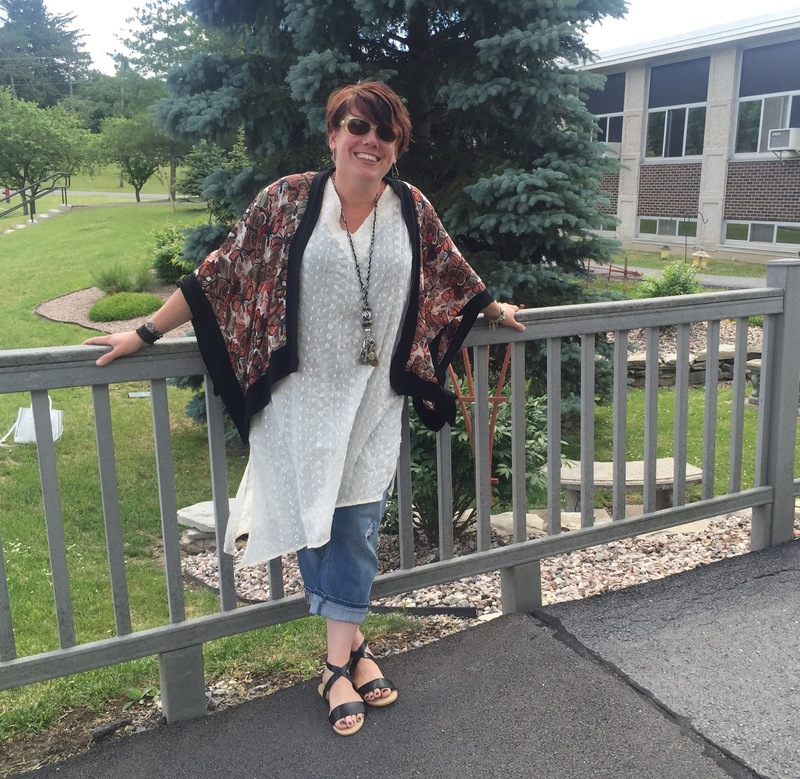 This post offers me so many inspirations on wearing my tunic. So many great look! I have to be super careful with tunics because they make me look pregnant sometimes. The blue one you're rocking is super cute!!! Thank you for the feature!!!! Jill, so many amazing interpretations of styling a tunic! 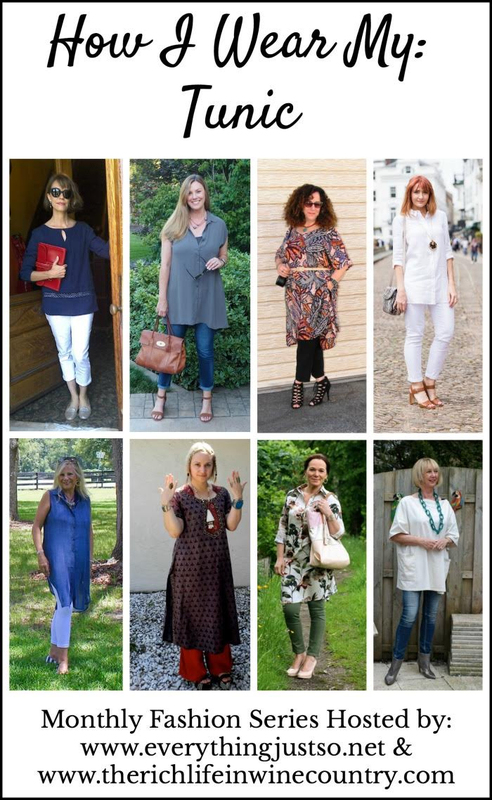 I am a huge fan of tunics and now I have so many new ideas from all of you fabulous ladies! Thank you so much for putting together this series every month! It is always so much fun!